Keep a sharp eye on oil sands plan. (David Self Newlin | The Salt Lake Tribune) A U.S. Oil Sands tar sands pit near PR Springs in eastern Utah. Utah Tar Sands Resistance which is camping at PR Springs in what they call a permanent "protest vigil" in an effort to stop development of tar sands in the area. Utah environmental regulators are giving minimal oversight to a small test of a technology that poses a large hazard to the small amount of water to be found in eastern Utah. The Utah Division of Water Quality says there is no water to protect at U.S. Oil Sands&apos; 200-acre mine in the Book Cliffs area of eastern Utah. 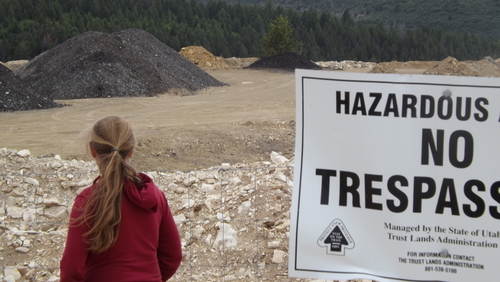 So it has granted  with little research or significant public comment  a permit for the company to start rolling out what it says is an environmentally friendly means of extracting a heavy sort of petroleum from rock and sand that belongs to the state&apos;s school trust lands. But critics of the plan, both in academe and protesting on site under the banner of Utah Tar Sands Resistance, say there is groundwater there, groundwater they are drinking at their campsite. They stress that the mine sits amid a watershed crucial to millions of people throughout the Southwest. Water or no, what is certain is that the state is so far accepting, with too much credulity, promises from the latest squad of extractive economy enthusiasts that their plan will bring real economic benefit with minimal environmental risk. Unlike every other boom-and-bust oil and mining scheme to besmirch the West over the past century or so. U.S. Oil Sands (it sounds so much friendlier than "tar") insists that it will use  and recycle  minimal amounts of water and that its magical process uses a natural "citrus-based" solvent that is no more dangerous than orange peels. But any solvent used in any mining operation, no matter how wholesome it may be in isolation, threatens to dislodge a veritable periodic table of potentially toxic substances. It their eagerness to get the ball rolling on a project that its backers promise will make money, create jobs and pay handsome royalties to the state&apos;s school trust, the trust lands administrators and the water quality agency have given the go-ahead to a plan that should have waited for a much more detailed environmental impact review. We don&apos;t know if its theoretical process will work on a 200-acre mine and, if it does, whether it will work on the whole of the company&apos;s 6,000-acre lease. We don&apos;t know if it will work under real field conditions, where workers get tired and can be eager to cut corners, or only under ideal and scrupulously supervised conditions. Given all those concerns, and given the fact that any 21st century fossil-fuel based business plan is susceptible to being abandoned and leaving the state to clean up the mess, state officials are going to have to watch this small project like a Utah red-tailed hawk, and not hesitate to pull the plug if it does not work as promised.